A company may transact any item of business through postal ballot other than ordinary business and any business wherein the directors or auditors have a right to be heard at any meeting. If a resolution is assented to by the requisite majority of the shareholders by means of postal ballot, it shall be deemed to have been duly passed at a general meeting convened in that behalf. One Person Company and other companies having members up to two hundred are not required to transact any business through postal ballot. 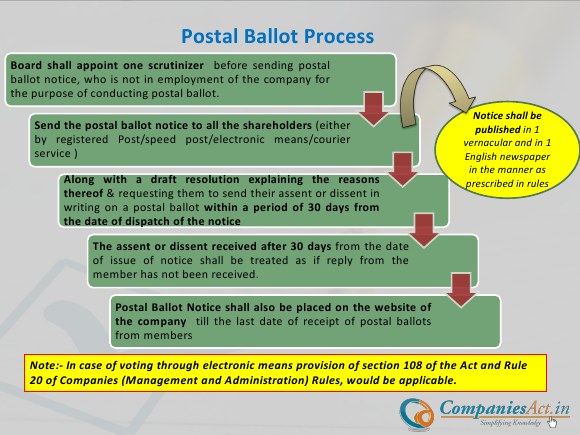 1) Where a company is required or decides to pass any resolution by way of postal ballot, it shall send a notice to all the shareholders, along with a draft resolution explaining the reasons therefore and requesting them to send their assent or dissent in writing on a postal ballot by post or through electronic means within 30 days from the date of dispatch of the notice. g. Contact details of the person responsible to address the grievances connected with the voting by postal ballot including voting by electronic means. 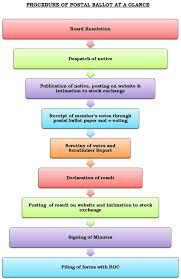 4) The notice of the postal ballot shall also be placed on the website of the company after the notice is sent to the members and shall remain on such website till the last date for receipt of the postal ballots from the members. 5) The Board of Directors shall appoint one scrutiniser who is willing to be appointed as such. He should not be in employment of the company and should in the opinion of the Board be able to conduct the postal ballot voting process in a fair and transparent manner. 6) Postal ballot received shall be kept in the safe custody of the scrutiniser till the chairman considers, approves and signs the minutes. 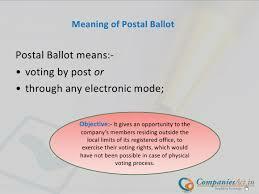 No person shall deface or destroy the ballot paper or declare the identity of the shareholder. 8) The scrutiniser shall maintain a register either manually or electronically to record their assent or dissent received, mentioning the particulars of name, address, folio number or client ID of the shareholder, number of shares held by them, nominal value of such shares, whether the shares have differential voting rights, if any, details of postal ballots which are received in defaced or mutilated form and postal ballot forms which are invalid. 9) The scrutiniser shall return the ballot papers and other related papers or register to the company who shall preserve such ballot papers and other related papers or register safely. 10) The assent or dissent received after thirty days from the date of issue of notice shall be treated as if reply from the member has not been received. 11) The results shall be declared by placing it, along with the scrutiniser’s report, on the website of the company. 12) The resolution shall be deemed to be passed on the date of at a meeting convened in that behalf. 13) The provisions of rules regarding voting by electronic means shall apply, as far as applicable, mutatis mutandis to this rule in respect of the voting by electronic means.